I hope your week has been going fabulously! I have some wonderful and exciting news to share today. I am now on the Scrapper's Delight Design Team. I am on the Thrifty Thursday Team - WooHoo!! I am thrilled and over-joyed and thank you so much Janice for such a wonderful opportunity. It means so much to me. And this is my first project which is a greeting card using this fabulous image called "Ballet Fairy." 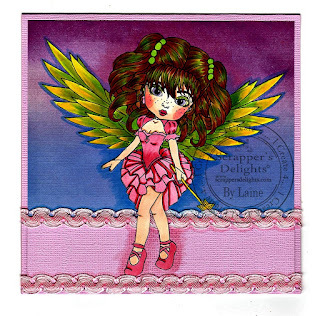 This adorable ballet fairy is part of Thrifty Thursday's at Scrapper's Delight which means that she and some other adorable images are only a $1.00 for a limited time. The link above takes you to Janice's Store. I then added a light base color to her wings and moved on to her hair. I do a lot of paper-piecing/fussy cutting and fortunately she was easy to cut out. I printed another image of her onto the multi-tone cardstock and glued the colored image on top. I wanted to give a festive look and added the two rows of ribbon. She was a joy and delight to color. I hope you will check out the Scrapper's Delight store. There are so many amazing images to color as well as the Thrifty Thursday $1.00 images. The link is above. Wow stunning. Love your image which you have coloured so beautifully. Nice work. Thank you so much for stopping by Annette. I really appreciate your wonderful comment. You made my day. Beautiful card! So lovely image and your coloring is amazing! Wow! Thank you very much for sharing this beauty with us at 613 Avenue Create this week. Good luck and hope to see you next time too!